In this game, each player represents a species of dinosaur vying for dominance on Pangaea, the large protocontinent of Earth. During the game, the continent breaks off into chunks. Whenever a new island is formed this way, the dominant species on that island gets 2 VP and the second-most dominant one gets 1 VP. 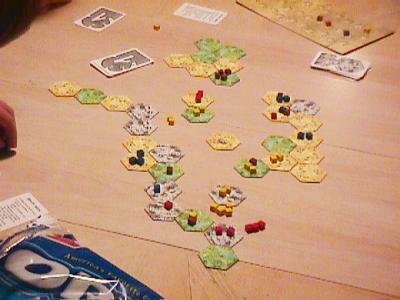 The other way to score is at the end of the game, when each island has a final scoring of X VP to its dominant inhabitant and X/2 VP to its second-most dominant inhabitant, where X is the size of that island.